Completing airfield construction around the hustle and bustle of fully operational commercial service is challenging enough. But the margin for error is almost nonexistent when flights are grounded right before Christmas and the work window is just 15 days. 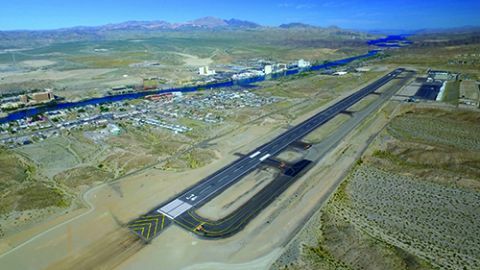 The team that performed the recent runway extension at Laughlin/Bullhead International Airport (IFP) in Bullhead City, AZ, pulled off that very feat. "One of the challenges we had was the selected dates were right in the middle of winter and right up against Christmas and the holidays," says Jeremy Keating, director of IFP and the Mohave County Airport Authority. "There was a lot of concern and worry going into this project about the weather." Specifically, crews needed the right temperatures to lay asphalt. The primary element of the $18 million project was a 1,000-foot extension of Runway 16-34 and parallel Taxiway A. The first phase spanned from November 2015 to September 2016, and included site preparation, grading and drainage improvements. The second phase, which concluded this March, entailed substantial paving and electrical improvements. Although construction broke ground in 2015, Keating notes that the project had been in the works for more than a decade. The lag largely was due to the environmental assessment, which took about seven years to complete. Once the airport authority received a finding of no significant environmental impact from the FAA, the project team fit the design and two construction phases into IFP's capital improvement plan. The design phase then began in September 2013. The first phase of the project cost about $7 million, with 92.4% coming from an FAA grant, 3.8% from an Arizona Department of Transportation grant, and another 3.8% from local passenger facility charges. The price tag for Phase 2 was about $9.5 million, with the same funding sources and cost sharing. Stantec, the airport's on-call engineer for about 30 years, designed the extension to improve safety and aircraft stage length. Mark T. Koester, a principal at the firm, notes that the area's summer weather played an important role, with high temperatures regularly topping 120 degrees. Because many of IFP's flights are casino charters that fly from specific destinations just once a month, the airlines can't simply remove luggage or put passengers on other flights to lighten the load. The only thing they can do is limit the fuel, which then requires a refueling stop and additional cost due to airport fees for aircraft servicing. "A runway extension was justified to relieve air carriers from these high-density altitude penalties," explains Tim Bannon, assistant airport director for the Mohave County Airport Authority. • ensured that precision approach path indicators were in place and certified for use. "There was just a lot of coordination and a lot of work that had to get done in that timeframe," reflects Andre Roen, project manager for Phase 2 general contractor McCormick Construction. "It took a lot of gearing up on everybody's part to get it done on time." Even with the most exhaustive planning possible, no construction team can control the weather. Cool winter temperatures restricted paving operations, which delayed progress by about a day, explains Roen. "There's always something to do, so we moved on to things we could do until the weather was back in our favor, and proceeded on," he adds. To complete the 1,000-foot asphalt extension in time, and allow time for electrical work and painting, McCormick set up two asphalt plants and used two paving machines. The company could not pave 24 hours a day because it was too cold in the evenings; but crews paved from sunrise until about 10 p.m. most days. As the paving operations neared the end, crews applied temporary airfield markings to enable IFP to open operations for commercial aircraft. 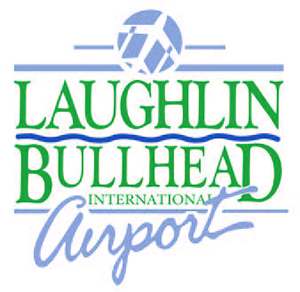 The runway closure was closely coordinated with stakeholders-specifically Harrah's Laughlin and Riverside Casino and Resort, the two resorts with casino air charter programs. Bannon notes that the airport began coordination meetings with the resorts and airlines almost a year in advance to help select dates that everybody could agree upon. During the environmental assessment, concerns emerged about an adjacent dry river basin, also known as a "wash." The design team assumed that a large box culvert would adequately fill the wash. However, the U.S. Army Corps of Engineers determined it would be less harmful to the environment to leave part of the open wash in place. "We ended up with an open channel, which is easier to maintain and a little friendlier to the environment," Koester explains. Because the wash in question was located on the south end of the airport where the extension was being built, significant fills were required. Further complicating matters, the wash channel sloped from east to west at a 4% natural grade in erodible soils. FNF Construction built a new embankment for the runway and taxiway extension, raising the ground level 10 to 40 feet for the extended runway safety area. Crews used soil cement, a fine-aggregate mix that contains about 7% cement, in areas that required the most fill. FNF Project Manager Mike Lynch explains that soil cement is a cost-effective alternative to concrete, and is often used on bridge projects on both sides of a wash to protect the bridge from erosion. "The soil cement allowed us to build steeper embankment slopes that were not erodible," adds Koester. "We built the soil bank protection from the bottom to the top in successive layers." Because this portion of the project included work in "jurisdictional waters," it required a special permit from the U.S. Army Corps of Engineers. Throughout Phase 1, earthwork crews moved approximately 340,000 cubic yards of material.